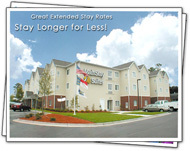 Mainstay Suites Wilmington is the hotel that gives you the feeling of “home away from home”. The hotel provides full kitchen facilities including refrigerator, freezer, ice maker, dishwasher, coffee maker, two burner stove, pots, pans and dinnerware. The services provided by the hotel include the Manager’s reception, free continental breakfast and free local calls, fitness center, outdoor pool and a business center. In addition, the three-story hotel also has an outdoor picnic area with gas grills.